The Yeunkyung Woo Achieve Excellence Travel Scholarship Fund was created in 2002 by the Biological Sciences Department in memory of Yeunkyung Woo, a talented, energetic and well-loved PhD student. Yeunkyung’s expressed desire was to get the opportunity to present her work at major scientific meetings, and this fund provides a $500 travel award to help our current graduate students do just that. Chennan Li will give his presentation at the upcoming 3rd International Conference on the Long and Short Non-Coding RNAs in Crete, Greece. Alexandr Pak will use the award to travel to the upcoming 2019 Computational and Systems Neuroscience (Cosyne) conference in Lisbon, Portugal. Trevor Vannatta will be presenting at the upcoming 94th Annual Meeting of the American Society of Parasitologists at the Mayo Clinic in Rochester, Minnesota. 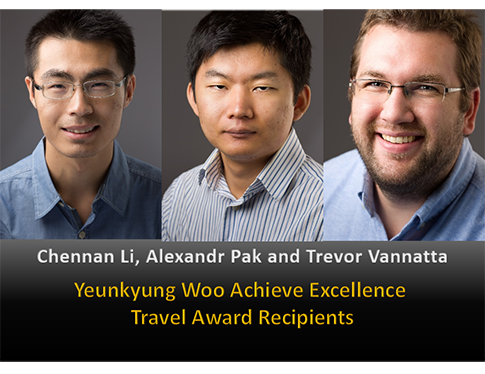 Congratulations to Chennen Li, Alexandr Pak and Trevor Vannatta!